My 4-year-old daughter loves to dance. She has been taking a ballet and tap combo dance class for about a year and a half now. She just had her winter showcase and it melted my heart. She is learning actual dance terms and ballet skills like “passé,” “demi plie,” and “chanié turn.” It was so fun watching her cute snowman dance they have been practicing. She was so proud of herself and I love how much confidence dance has given her. 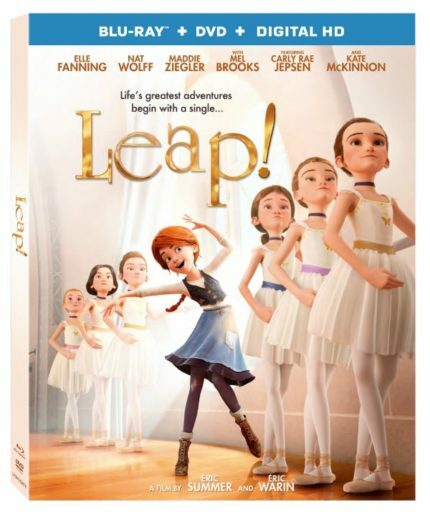 The new movie from Lionsgate called Leap! is now on Blu-ray, DVD, and Digital HD. It is a movie all about dance and I am sure it will be on repeat at our dancing loving house. Leap! is all about a darling little orphan girl named Félicie who has a dream of becoming a ballerina. Eleven-year-old orphan Félicie has one dream — to go to Paris and become a dancer. Her best friend, Victor, an imaginative, exuberant boy with a passion for creating, has a dream of his own — to become a famous inventor. In a leap of faith, Victor and Félicie leave their orphanage in pursuit of their passions. But there’s a catch: Félicie must pretend to be the child of a wealthy family in order to gain admittance to the prestigious and competitive Opera Ballet School in Paris. And with no professional dance training, she quickly learns that talent alone is not enough to overcome the ruthless, conniving attitudes of her fellow classmates, led by the devious Camille Le Haut. Determined to succeed, Félicie finds her mentor in the tough and mysterious school custodian, Odette, who, along with Victor’s encouraging friendship, help her reach for the stars. I love that this movie has such a great message. It is so important for kids to know to always try their best, work hard, and dream big. I think this movie is also such a great example of the importance of friendship and being a good friend. It also has amazing original music like “Cut to the Feeling,” by Carly Rae Jepsen. Halli loves this song so much and we have been listening to it while dancing around the house for months. Leap! also includes a behind-the-scenes video gallery and a look at stars Kate McKinnon, Nat Wolff, and Maddie Ziegler in the recording booth. There are also other special feature behind-the-scenes videos include a The Birth of a Dream, Animating the Dance, and Reconstructing 19th Century Paris. This would be such a great family gift or stocking stuffer for your little dancer. It is such a beautiful movie with a wonderful message and fun music. Your entire family will love this movie. Leap! You can find Leap! on Blu-ray, and DVD at Amazon, Walmart, and Target. SOme how we missed seeing and getting this movie, we’ll have to check it out for the next family movie night.